He only served 16 days in the front line. For is service he is honoured at the Vimy Memorial and he will not be forgotten. Private Ernest John Dorken joined the C.E.F. on January 4, 1916 in Woodstock, Ontario. It appears that he was one of three sons of the Dorkens that would volunteer for service with the Canadian Army. At enlistment, he was assigned to the 168th Battalion and was on their nominal roll from January to November of 1916 where he was struck off strength from the 168th Battalion to the 12th Reserve Battalion at West Sandling May 12, 1916. On April 1, 1917, he was struck of strength from the 12th and taken on strength with the 4th Reserve Battalion, with which he served until he was taken on strength with the 18th Battalion on April 13. From there he was transferred to Etaples, France and was located with the Canadian Base Depot from April 16 until he joined the 18th Battalion on May 12, 1917. One wonders what Private Dorken felt as he moved up the line. The 18th Battalion had been recently successively engaged in the attack on Vimy Ridge and had served in the Thelus sector since the initiation of the offensive just over a month ago, on April 9, 1917. He was moving into an experienced Battalion with many men, like himself, new replacements making up for the “wastage” of war in an attempt to get the Battalion back to its normal nominal strength of 1,000 men. The Battalion had approximately 650 men engaged during the Vimy attack, making it 60% of nominal strength. The night of May 27-28, 1917 was to be a fateful one for Private Dorken and four other of his comrades, men he barely got a chance to know. This is an overlay of the map from the 18th Battalion War Diary showing the relative location of the action on the night of May 27/28 where Private Dorken perished. The green thumbtack indicates the center of the right flank. Private Dorken and the wiring party would be to the right of the pin and before the German wire and line marked with the ‘x’ denoting wire and the solid lines denoting the German trenches. The yellow pin marks the location of the Battalion Headquarters. The map as above, less the overlay. Acheville can be seen in the right, behind the German lines, and though indistinct, the demarcation point between “D” and “C” Companys’ area of responsibility is the road D46E2. 1.00 a.m. Enemy opened barrage on Battalion H.Q. MT. FORET QUARRIES, our Support Line at T.23.a.6. and our Front Line. The barrage on the Front Line lifted at 1.15 a.m. then two raiding parties, each estimated at 25 or 30 men, one on each side of the MT. FORET – ACHEVILLE ROAD, were seen approaching our wire. Fire was opened by M.G’s and rifles. Unable to get through the wire and checked by our fire the enemy retired. Of the party on the left frontage two of the enemy succeeded in getting through the wire, one of whom was severely wounded and taken, and the other gave himself up and was immediately sent back to Brigade H.Q. In the evening a dead German was brought in. On the right frontage wiring was in progress and a N.C.O. and 6 men were well out front of our wire, when the barrage opened the N.C.O., Cpl. L. Skilton, gave orders for the party to retire. Immediately after the raiding party were seen and dispersed by our fire. As soon as all quietened down a search party went out but failed to find the three men of the protecting patrol who were found not to have returned. Two rifles were found in a shell-hole but no other trace of them. The night raiding party came on the road and immediately to the right of it. The left party about 250 yards from the road. At daybreak Huns were seen carrying in casualties and stretchers were seen during the day on the BOUVRY ROAD also our observers report seeing 10 or 12 dead lying in no-man’s land today at T.18.c.6.5. Our casualties during the raid were 3 men Missing, 1 man Killed and 1 man wounded. Page 1 of report from 18th Battalion to 4th Canadian Brigade regarding German Trench Raid on night of May 27/28, 1917. 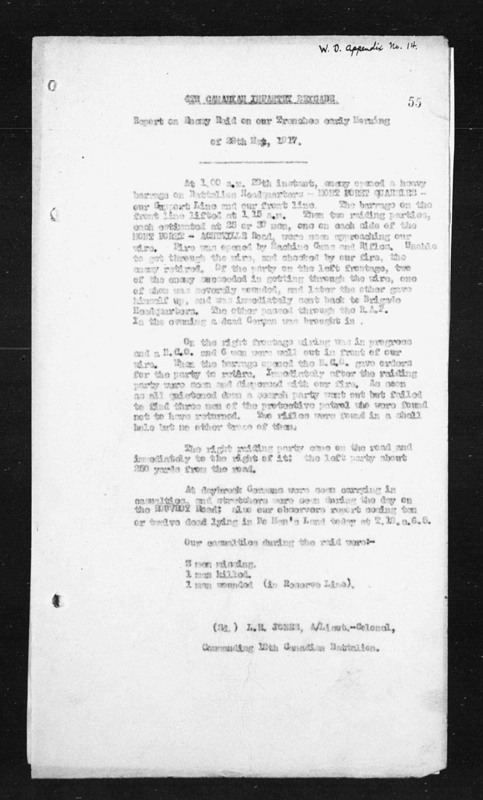 Page 2 of report from 18th Battalion to 4th Canadian Brigade regarding German Trench Raid on night of May 27/28, 1917. Page 3 of report from 18th Battalion to 4th Canadian Brigade regarding German Trench Raid on night of May 27/28, 1917. From the report it is evident that Private Dorken was one of the wiring party “well out front” of the Battalion’s front line. They must have either perished due to shell fire or encountered the German patrol during its advance in preparation to the raid on the Canadian trenches and in order to prevent the wiring party raising the alarm engaged and eliminated the wiring party as no record of prisoners can be found. The initial estimate 3 men missing and 1 man killed appears incorrect and the report creates some confusion. Corporal Skilton and his men were tasked with covering the wiring party and it is this party, not the wiring party, to which he gave the order to retire. From the after action reports it appears that there was no contact with the non-commissioned officers in charge of the wiring party, nor the men of the wiring party. Further adding to the confusion is that the search party appears to be only tasked with searching for the men of the “protecting patrol” and the 18th Battalion War Diary makes no mention of any effort to ascertain the fate of the seven men of the wiring party. There were definitively five men killed in action that day serving with the Battalion. Private Billington, reg. no. 823145 body was found and buried at La Targette British Cemetery, Neuville-St.-Vaast. Private Dorken has no known grave. Private English, reg. no. 159068 is buried at Orchard Dump Cemetery. Private Heathers, reg. no. 213018 has no known grave. Private Hughes, reg. no. 159529 died of wounds received on that day and died at No. 6 Casualty Clearing Station. It cannot definitively be determined to which party these men belonged to from the reports as they may reference the state of events only at the time of report submission. Later, soldiers of the two parties could have returned to the Battalion. Regardless of the circumstances of the death of Private Dorken he is remembered. A recent visit by a relative to France he shared some images of his Great-Uncle at the location of the action and at his inscription at the Vimy Memorial. We appreciate these images and the memories the evoke. [i] 4th Canadian War Diary. May 1917. Appendix no. 14.